A World Championship. A career-best result. For Joanne Reid of the US Biathlon team in Östersund, Sweden, the recently concluded IBU World Championships were a highlight. It was a fine series of races for the twenty-six year old last week — it was a great moment for her to rise and shine. Out of 93 starters, she placed 15th in the 7.5 k sprint. She followed that result several days later with a 10th overall in the 12.5 k mass start. Sandwiched inbetween was a stellar performance for the US women in the 4 x 6 k relay. For much of the race, the US team was well positioned for a medal. The combo of fast skiing and accurate shooting meshed. The team faded to place ninth overall – yet the positive energy from the collective effort did not immediately fade. The relay came the day prior to Reid’s mass start race. It was Reid’s first mass start at this level of IBU competition. She shot 1+1+1+1 during her four shooting bouts and skied fast enough to mark those faster skiers around her and not lose ground. Reid explained that during her third shooting bout, a big wind passed through which only impacted her first few shots, and she was able to capitalize. As the race evolved, Reid heard her teammate Susan Dunklee, who had not qualified for the mass start, out on course providing critical race status data. That was the rabbit to chase. It was a well-defined marker for pace setting and goal achieving. It helped cement her 10th place. These World Championships brought celebration worthy results for Reid. Yet the disparity between expectations and results, when they do not align, can be debilitating. 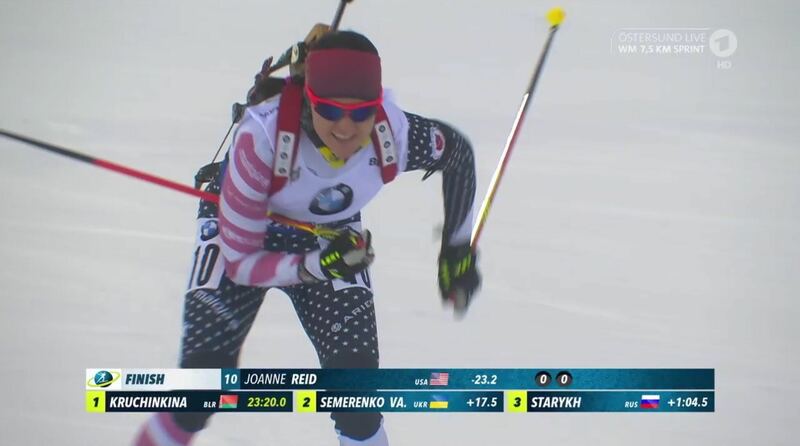 Reid asserts she weathers the ups and downs of biathlon by relying on her own internal mechanisms and teammates to process disappointment. The lows and highs become what they are: simply a result in a ski race. The massive upside of moving on in a fickle sport provides the opportunity for another new chance. Reid noted how she perceives her ability to keep steady — to remain present in the game and the training and not allow a past performance to dictate the path forward. In Östersund, Reid raced to 32nd in the 10 k pursuit after her 15th in the sprint. (Time back on the pursuit is determined by the sprint results.) She skied six penalty laps in the pursuit, going 3+2+1+0 for her shooting.